Wow twice in two days you choose to use a tragedy still going on to take a shot at the party you do not like. If it was you homeless cold and not able to find gas or shelter would you feel the same way ? Opoib whose friends lost everything to Sandy and now are sleeping in a shelter. Opoib and Nonnymoose: A changing climate has nothing to do with politics... Mother Nature doesn't give a rolling doughnut who's in charge. jeez, must everything be explained in childlike terms to these posters? However, FEMA does have to do with politics and Mittens has vowed to end the federal gov't agency... and I'm sure that the good folks effected adversely by Sandy would not be amused if FEMA were not around at a time like this. So called "conservatives" draw the line at conserving the planet for future generations. "Selective Conservatives" would be a more appropriate name. Sorry to disappoint folks, but one cannot prepare for the future if one is stuck in the past. R&W read the two posts, both the cartoon and the 1st posting were shots at a political party in the wake of people dying and suffering. Is throwing salt in the wounds of the homeless and the dead and the injured from the hurricane, to make a political point helping anyone who is in a shelter with no home or possessions to go back to? Opoib, your comments here strike me as overly self-righteous. I also have family in NY & NJ who are living with the effects of Sandy. Criticizing the Republicans' denial of climate change isn't exploiting their suffering. It's standing up to say that we don't want more storms like this. Sadly, because politicians are trying to wish away sea-level rise and the other negative effects of climate change rather than doing anything about it, severe weather and coastal flooding like this is probably going to become more common. My sister worked a 5am-5pm shift in NYC today getting food and water to people who need it. And she would be the first to repost an editorial cartoon like this. "Throwing salt in the wounds of the homeless and the dead and the injured from the hurricane"....? Thankfully FEMA (and other government workers like cops, firefighters, EMS, etc) are there to provide food, water, shelter, medical assistance, rescue, recovery, fuel, and information (I could go on). All of the above will be tagged for cut or elimination in a Romney/Ryan austerity era. On the other hand you have a candidate, ney, an entire party (you listening Virginia Foxx?) proclaiming that those effected would be better off without the government coming to their aid. Once again, you tell me which of the two is throwing salt in the wounds of those dealt such a tragic blow? I would argue that raising awareness is doing a service for the good....and my friends and family in Brooklyn, Queens, Manhattan, NJ shore, and elsewhere in the region all agree and are forever grateful for the prompt and effective response they received post Sandy (shelter, food, water, fuel, rescue, recovery, and, perhaps most importantly, reassurance that their government will be there in a time of crisis to help them get back on their feet). 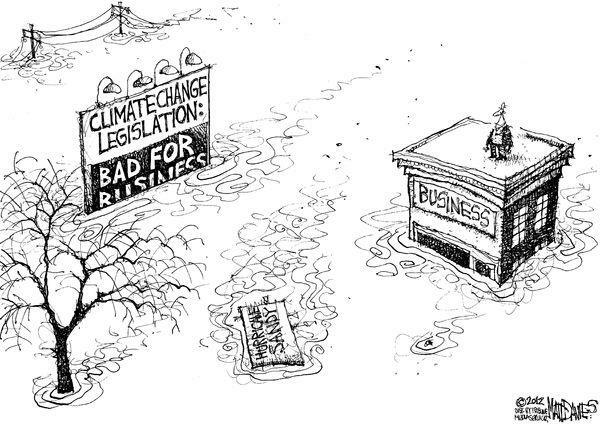 You ignore the fact climate change legislation is bad for business and does nothing to effect climate change. "You ignore the fact climate change legislation is bad for business and does nothing to effect climate change." Platitudes are no substitute for intelligent discourse Nonny. Bring some game next time. I thought the democrats were supposed to be the caring and compassionate party. Looks the opposite to me .